The El Audaz (foreground) underway with the Centauro Del Norte. Steering gear is hydraulic, a Wag- ner LAZ-16-35 furnished by W.E. Detroit 12V71 diesel engine with an output of 400 bhp at 2,100 rpm. WO 332 brailing winch, and B56A power block. Miscellaneous Gear- matic winches are provided for vanging, topping, choking, and strapping. Sperry 8T autopilot and a Mark 37 gyrocompass. Krupp-Atlas sonar model 950 was also included in the electronics package. International Paint coating sys- tems, Engelhard Chloropacs, Ev- erpure chlorinators, and Micros fresh water distillers. The Bender-built tuna seiners have steel hulls and pilot houses of aluminum, reinforced for heli- copter landings. Each boat is ca- pable of carrying 1,200 tons of fish, 85,000/200,000 gallons of fuel, and 8,500 gallons of fresh water at a speed of 16 knots. Express, and Sultan Express—are on long-term charter to ARAMCO. Each has an overall length of 110 feet, molded beam of 26 feet, and molded depth of 10 feet 6 inches. Main propulsion power is sup- plied by twin GM Detroit Diesel 16V71 engines, each with an out- put of 455 bhp at 1,800 rpm, driv- ing through Twin Disc MG 518 re- duction gears having a ratio of 5:1. Detroit Diesel 4-71 engines at 1,200 rpm. SSB radio, Datamarine Digital 3000 fathometer, Texas Instru- ment 9900 Loran C, and two Sailor 144 MAC VHF radios. Coatings were supplied by Devoe Coatings. If you see two towing companies here, you're right! Des Allemandes, La. 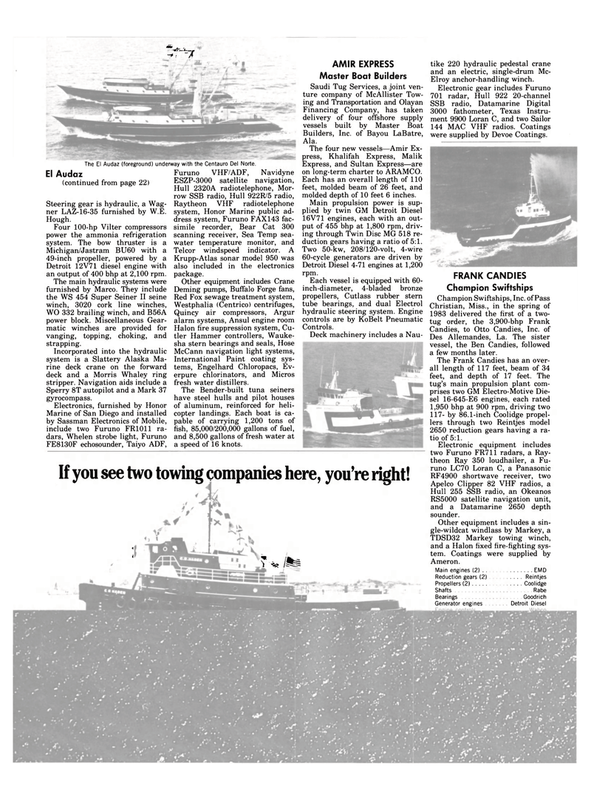 The sister vessel, the Ben Candies, followed a few months later. The Frank Candies has an over- all length of 117 feet, beam of 34 feet, and depth of 17 feet. The tug's main propulsion plant com- prises two GM Electro-Motive Die- sel 16-645-E6 engines, each rated 1,950 bhp at 900 rpm, driving two 117- by 86.1-inch Coolidge propel- lers through two Reintjes model 2650 reduction gears having a ra- tio of 5:1. RS5000 satellite navigation unit, and a Datamarine 2650 depth sounder. Main engines (2) . .